FYI: You can still this entire look here. Did you know that the color you paint your bedroom can impact how fast you fall asleep and the quality of your zzz’s? 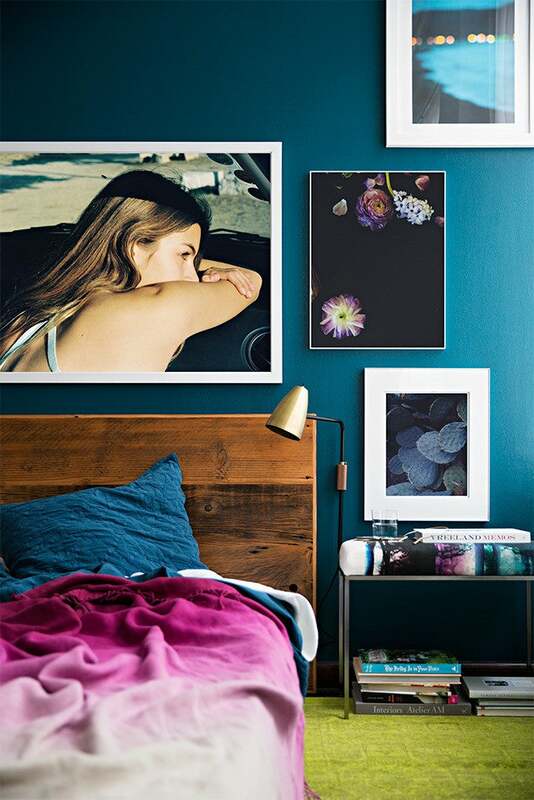 Grays, blues, and other muted tones can promote sleep, whereas fiery reds and oranges can actually inhibit it (see our complete guide to the worst bedroom wall colors here). However, the importance of choosing the right colors extends well beyond your walls, but to your furniture and decor, too. Want to turn your bedroom into a relaxing retreat? Here, we present nine soothing hues—from dusty greens to icy blues—to try in your space. Never has shuteye never looked so chic. One way to make any room feel larger and simultaneously more serene? Light hues and lots of texture. That said, you’ll want to avoid a completely stark white scheme, as it often has the potential to make a space feel sterile and intense. Whitewashed walls and floors coupled with muted grays, blonde woods, and graphic art create a laid back sleeping chamber. A dark blue—think, one reminiscent of the night sky—is guaranteed to immediately launch you into a state of zen. In this boho oasis in Williamsburg, notes of ivory and handmade goods extend a sense of warmth and softness to the room. Likewise, the macrame wall piece picks up on the room’s underlying free-spirited attitude. There’s a reason lavender is currently trending. While there’s certainly a time and place to embrace a purple as bold as ultraviolet, the bedroom is not one of them. Swathed in a pale lavender wallpaper, fashion consultant Amanda Ross’s Manhattan bedroom is the perfect spot to recharge and doze off. Seemingly created with the sweetest of siestas in mind, this dreamy room, designed by Nicole Rosenberg, is a prime example of how gray doesn’t have to be drab. Rosy hues and ‘70s-inspired details, like copper pendant lamps and faux fur, add a cozy, luxe feel. Goodnight world, hello slumber. A restful shade of teal is guaranteed to stun, especially when displayed alongside powerful colors like fuschia and chartreuse. While there’s no such thing as one restorative color that puts everyone to sleep, this moody blue-green certainly comes close. Plus, we love how the hand-knotted rug—a cushy landing pad for bare feet come morning—picks up on the room’s green undertones. An icy coat of blue paint and a subtle patterned rug anchor this room’s serene vibe. Here, ultra-plush accents—like the faux fur bench and mint green throw blanket—balance out the room’s harsher metallic moments. Consider this proof that relaxing can also be posh. Immaculately decorated by Thom Filicia, this contemporary bedroom—replete with a plush suede platform bed, navy and white bedding, warm flaxen walls and just a hint of natural greenery—feels more like a calming retreat than a city view apartment. To spice up your neutral escape, get creative with texture. Velvet and rattan are too stellare places to get started. Want to get your full eight hours in? Take a walk on the dark side. A matte black accent wall can work wonders for the bedroom—and, not to mention, your health. An idyllic mix of masculine and modern, we love how this glam black and white bedroom dares to play with more saturated shades. A seafoam and moss green striped wallcovering, medium-toned wood, and neutral bedding give this room an earthy yet refined feel. In this case, less is definitely more. The lack of electronics and distractions will encourage you to curl up with a good book before hitting the hay.